A Soyuz 2 rocket is raised into position at Baikonur Cosmodrome ahead of the planned Oct. 19, 2010 launch of six new Globalstar mobile communications satellites. The vehicle was rolled out from its integration building to Launch Pad #6 on a transporter/erector rail car. Sixnext-generation satellites for theGlobalstar mobile communications network will launch from Kazakhstan ona Soyuzrocket Tuesday, the first of four missions to replace the company'saging spacefleet. Thelaunch is the first phase of a $1 billioninvestment to restore Globalstar's beleaguered two-way voice and dataserviceand extend satellite operations beyond 2025. Globalstar'sduplex voice and data servicefell victim to a problem with the existing fleet's S-band antennas.Firstannounced in 2007, the issue severely limits reliable satellitecoverage forusers on the ground. Thelaunch of 24 second-generation Globalstarsatelliteswill gradually bringback the curtailed two-way communications services. "Therewill be an immediate improvementafter each of the launches," said Tony Navarra, president of globaloperations at Globalstar Inc. "A month or two after this first launch,they will start to see improved services." Theantennadegradation does not affect Globalstar'ssimplex serviceused for data relayand asset tracking applications. 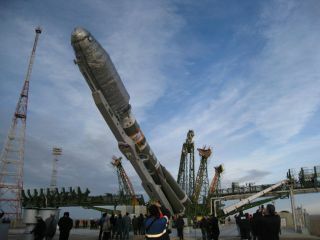 TheSoyuz rocket is scheduled to launch at1710:59 GMT (1:10:59 p.m. EDT) Tuesday from the Baikonur Cosmodrome inKazakhstan. The booster is flying in the Soyuz 2-1a configuration withanadvanced digital command and telemetry system and upgraded injectors inthefirst and second stage engines. "It'smoving according toschedule," Navarra said Monday in a phone interview from Baikonur. "The Soyuz rocket is on the pad now." Towedby a train, the four-stage rocket leftits Baiknour assembly building at 6:30 a.m. local time Saturday. TheSoyuz arrivedat the pad and was hoisted upright on the launch pad later Saturdaymorning. TheRussian launchteam will load the Soyuz with liquid oxygen and kerosene propellantsabout fourhours before liftoff. TheSoyuz will ascend above Baikonur and turneast, surpassing the speed of sound moments after liftoff and consumingall ofits first stage propellant two minutes into the mission. Therocket's four first stage boosters willseparate at T+plus 1 minute, 58 seconds. A single second stage coreengine willfire for another three minutes, before giving way to the Soyuz thirdstage. Aftershedding a bulbous ST-type payloadfairing, the third stage engine will shut down and release the Fregatupperstage. The Fregat main engine will ignite to place itself in a lowparkingorbit, then fire a second time to reach the Globalstar separation orbitat analtitude of 572 miles and an inclination of 52 degrees. TheFregat will deploy the six satellites inrange of Globalstar's ground station at Aussaguel, France. Clustered onacone-shaped payload dispenser, the first two 1,543-pound satellites arescheduled to separate at T+plus 98 minutes, 36 seconds. Therocket will release the other fourpayloads less than two minutes later, completing the mission at T+plus100 minutes,20 seconds. The Fregat will later fire a third time to guide itself toadestructive re-entry over the Pacific Ocean. Thesatellites' power-producing solar panelswill deploy between four and six minutes after separation, according toNavarra. Controllerswill test each satellite'ssystems before placing the spacecraft in Globalstar'sconstellation. Navarrasaid two of the satellites launchedTuesday will enter the constellation in about one month. It will beearly 2011when the other four spacecraft drift to their assigned locations. AnotherSoyuz rocketwill dispatch sixmore Globalstar satellites between January and March of 2011. Two moreflightsare planned at two-month intervals next year to finish launching the 24second-generation satellites, Navarra said. "Iwould say in the second quarter of2011 Globalstar will be back and providing the high-quality voice anddataservice that we had in the 2004 to 2006 timeframe," Navarra said. Builtby Thales Alenia Space, each newGlobalstar satellite is trapezoidal in shape and features 16transponders inC-band and S-band and 16 recievers in L-band and C-band. Thesecond-generationcraft are designed to work for 15 years, twice the design specificationof theexisting satellites, most of which have exceeded their plannedlifetimes. Globalstar'sfirst launch campaign orbited 48satellites on Delta and Soyuz rockets between 1998 and 2000. Thecompanylaunched eight more spare satellites on two Soyuz flights in 2007. Accordingto Navarra, there are about 40satellites left in Globalstar's space fleet. Officials are retiring theremaining satellites as new ones arrive in orbit. Theeight payloads launched in 2007 will jointhe 24 brand new spacecraft in the next incarnation of the Globalstarconstellation. "We'regoing to marry the 24 satelliteswith the eight already in orbit to have a 32-satellite constellation,"Navarra said.